This year marks the 25 th anniversary of the Minnesota Knitter’s Guild Yarnover event. 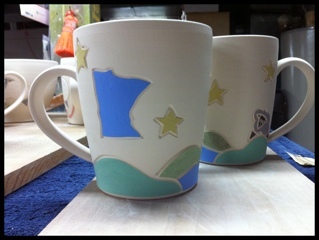 As i’ve been making mugs for other special events I attend, it was high time I made something for my MN peeps. 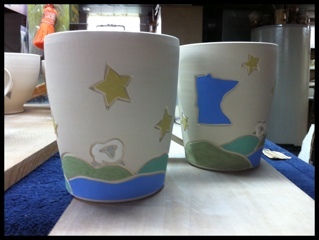 Here’s a shot of two mugs in their bisque state. There will be a limited number available at this year’s event. This entry was posted in studio and tagged MKG, mugs, Yarnover on April 18, 2011 by Jennie. OK, I gotta have one of these. I have coveted one of your mugs for years. This is it. Your little girl is just precious, btw. It was great to see you yesterday. I would love to order one for my brother-in-law, John, who is the hat knitting wonder. Let me know if I can buy one and I can swing by your house. Also, remember the eggs you did ages and ages ago. Well, I have them and could drop them off. Let me know. I’m going out to NY in mid May and would love to bring him a mug or knitting bowl. Let me know. I was lucky enough to bring one of these mugs home with me from Yarnover, having wanted one for years (but thinking that it didn’t make sense to fly a mug home to the Midwest from Rhinebeck, so that the airline could break it….) I thought, “Sheep! Minnesota! Jennie the Potter! Hooray!” It wasn’t until I got it home that I turned it over and saw the 25th anniversary commemoration. So cool! Thanks for making these! I will treasure it.